Fortnum & Mason is an institution in London. 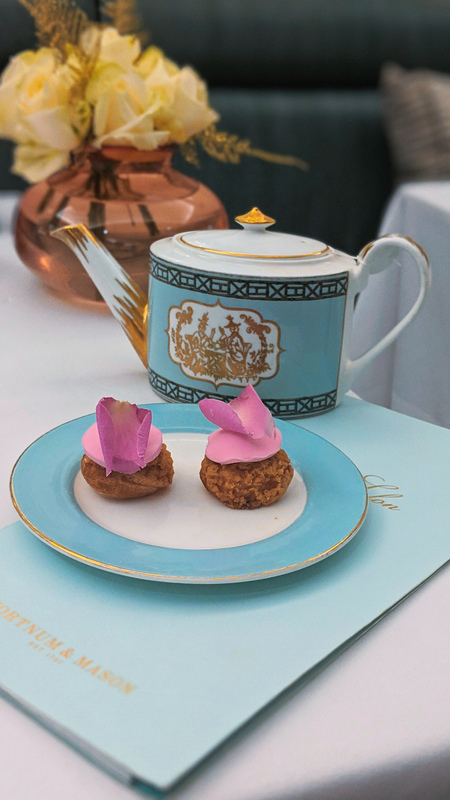 This iconic department store was established way back in 1707 by William Fortnum and Hugh Mason who had connections with the royal family and over the years, this store has become a London landmark. It also helps that the store sells some of the finest goods in the city or perhaps even the country but what is truly iconic about Fortnum & Mason is their Afternoon Tea. 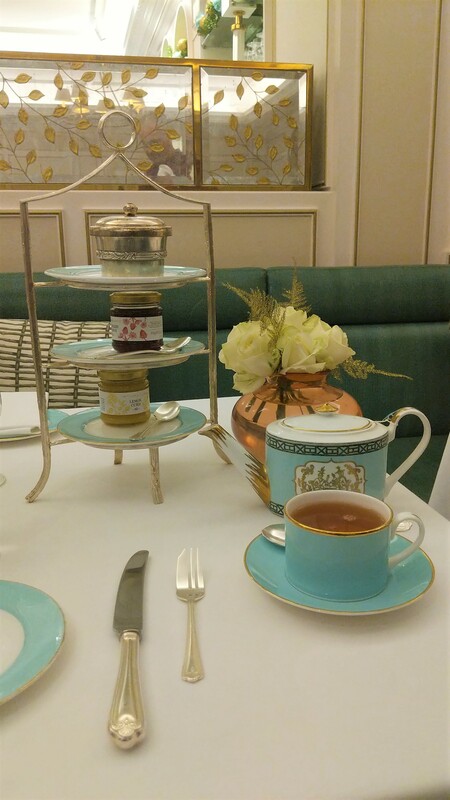 Fortnums Afternoon Tea again has a long history. 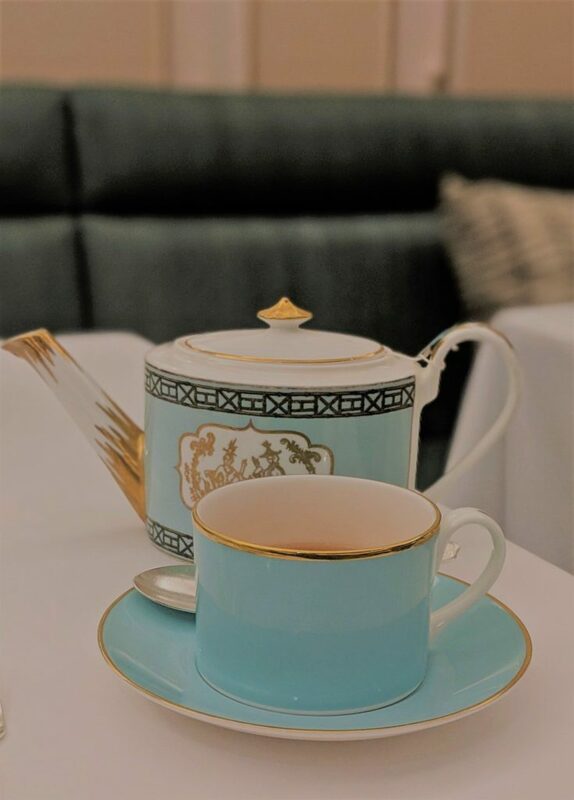 It was started in 1926 at the elegant Tea Salon now named the Diamond Jubilee Tea Salon in honour of the Queen’s visit in 2012, when she formally opened the room, in the company of the Duchess of Cornwall and the Duchess of Cambridge. The thing with the Afternoon Tea is that it is so popular you need to book way in advance to secure a table. I tried going there once in summer with my friend on a weekend and we were politely refused because we did not have a reservation but most importantly, they did not have any place for the next one month. Yes, it is that busy. Also, you cannot sit there forever. There is a time limit of 1.5 hours which means that for 90 minutes that start from the time you are seated, you can order as much food and refills as you want to from your choice of the menu. If you want to go there, you better go with an empty tummy. 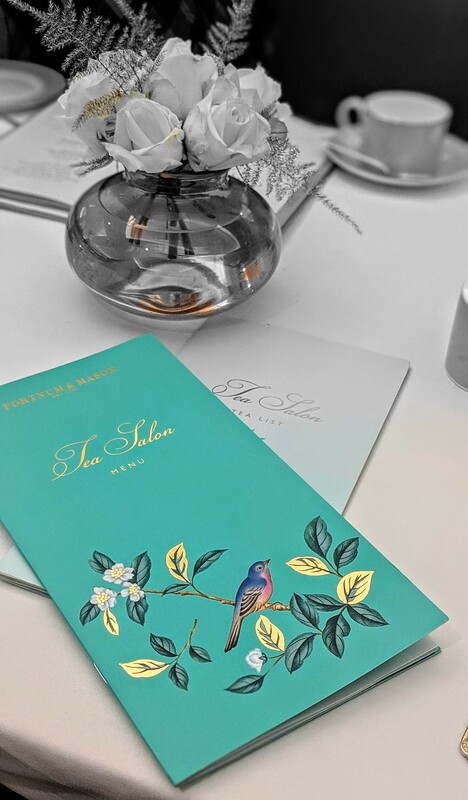 So what is about Fortnums Afternoon Tea that makes it so popular? Well, firstly, the location is really fancy so you feel rather fancy yourself. 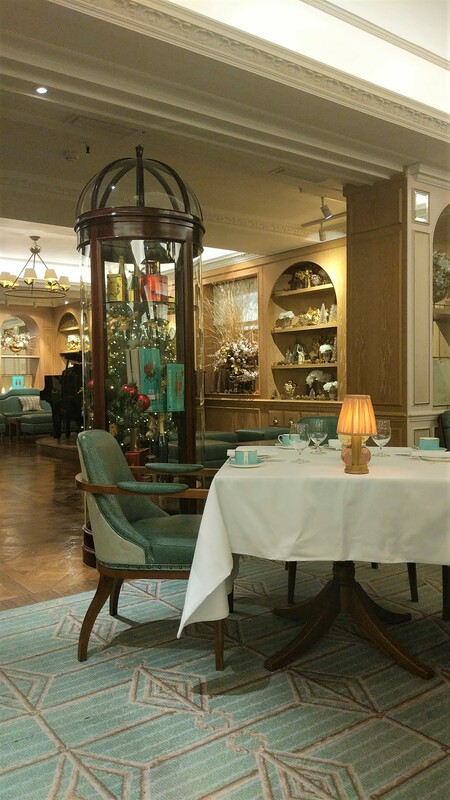 The Diamond Jubilee Tea Salon is an extremely elegant and refined setting for the tea. As soon as the elevator door opens to the salon, it becomes clear that you are in for a delightful experience. Because of the festive season, the salon is now decorated beautifully. 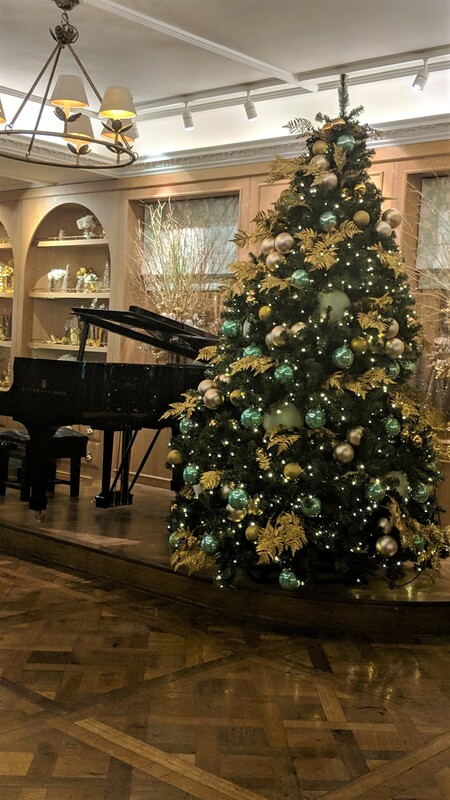 There is a big Christmas tree in the waiting area and a pianist playing a grand piano. 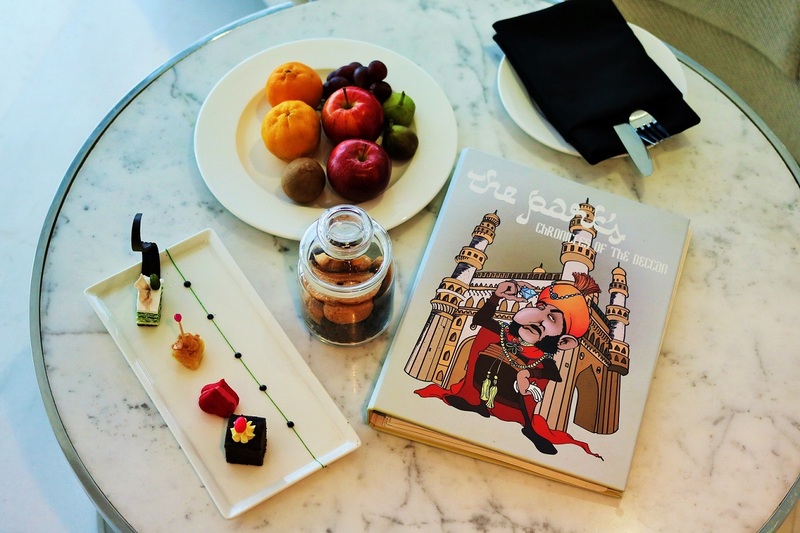 There are two areas where you can be seated – the Drawing Room, lined with hand-painted silk wallpaper or the North and South Salons oozing charm and sophistication. The colours of Fortnum, pale green and white are everywhere, from the decor to the china and cutlery. The Afternoon Tea is not just limited to the afternoon. It is available the entire day from 11.30 a.m to 7.30 p.m on weekdays and 11.00 a.m to 7.00 pm on Saturdays and you can choose from four options – Afternoon Tea, Savoury Afternoon Tea, High Tea and Vegetarian Afternoon Tea. 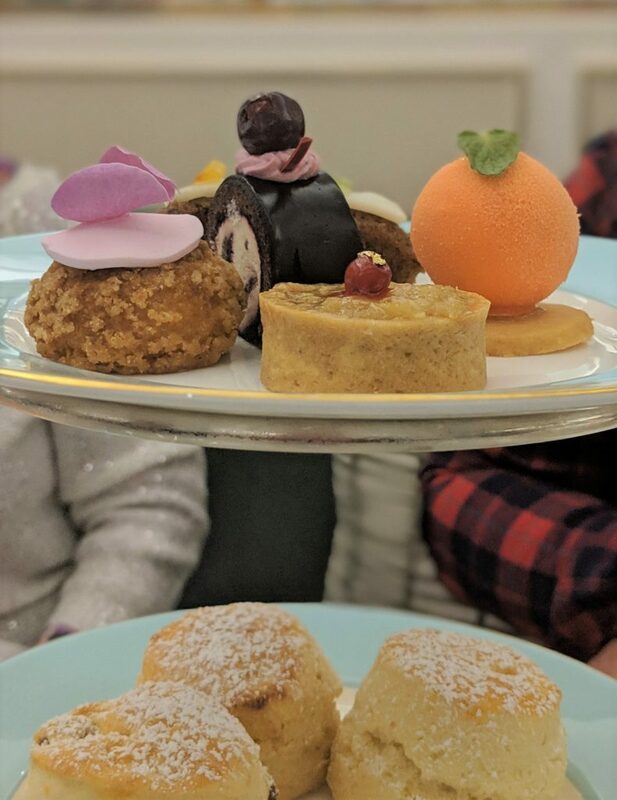 We were a group of four who went for the Tea experience at 11 a.m on a Saturday morning and after much deliberation, two of us decided to go for the Afternoon Tea and the remaining two went for the Savoury Tea. 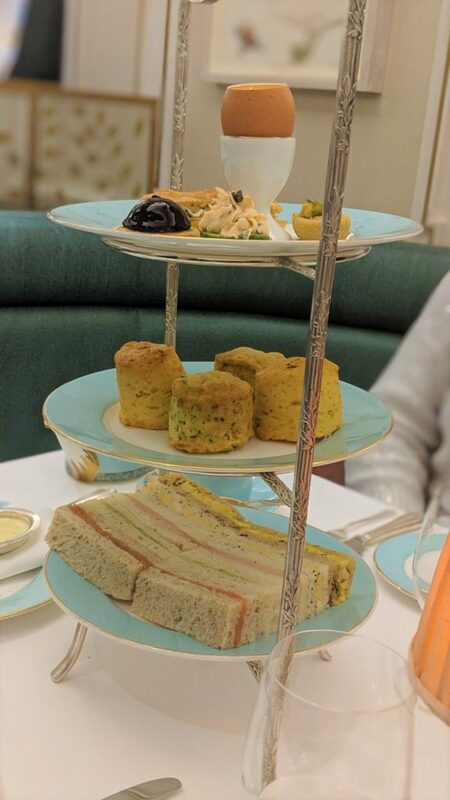 In my opinion, go for the regular Afternoon Tea instead of the Savoury version because you get a good mix of both sweet and savoury items in the former. My friend I think regretted his choice a bit because he was constantly eating out of our share and asking me to order for more. This is perfectly acceptable because you can order as much as you want to for a duration of 1.5 hours. What is in the menu? You get a selection of finger sandwiches, scones with clotted cream (savoury scones in the Savoury Tea menu), strawberry preserve and lemon curd and a selection of tea cakes and cakes from the cake carriage (tea savouries in the Savoury version) along with your choice of tea. For an extra £13 per glass, you can also order champagne. Coming back to the menu, the star for me was definitely the sandwiches especially the Smoked Salmon with Tartare dressing and the Suffolf Ham with English Mustard. Incredibly soft and light, these were heavenly. The scones were undoubtedly the best I’ve ever had. I am not particularly fond of lemon curd but I do love my scones with clotted cream and strawberry preserve and I might have had one too many. The good thing is that you can even take back the jars of preserve and lemon curd if you are unable to finish at the table. In fact you can take back anything from the menu that you are not able to finish. The servers will gladly pack the leftovers in a fancy F&M box and hand it over before you leave. From the tea cake selection, my favourite was definitely the Black Forest cake and a light as air cake with sugar rose petals on top. I was told that it is the Queen’s favourite as well. Not wanting to miss out on anything despite struggling to eat another morsel, I tried the Victorian Sponge cake, Battenberg cake and the Chocolate cake from the Cake Carriage. 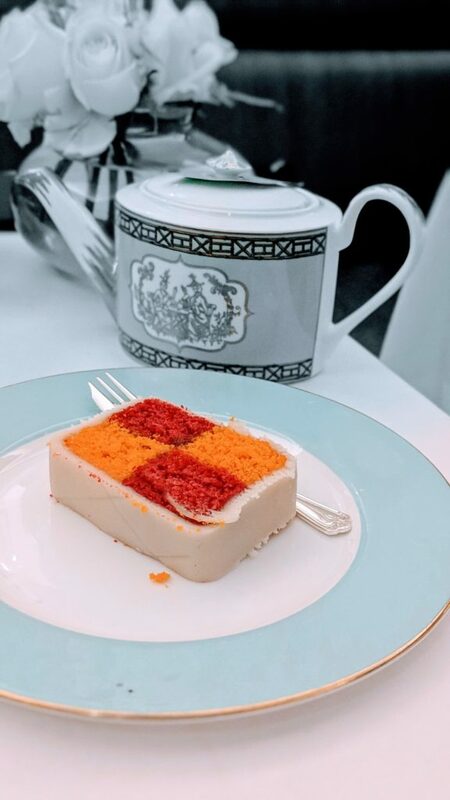 The Battenberg cake has been served with the Afternoon Tea since 1926 and is said to be created to celebrate the marriage of Princess Victoria to Prince Louis of Battenberg in 1884. This colourful cake with iced marzipan was a bit too sweet for my taste but everyone else loved it. Throughout my 1.5 hrs, I made sure to try as many varieties of tea as I could and ended up drinking chocolate violet, peach, vanilla and strawberry with the latter being the best of them all. 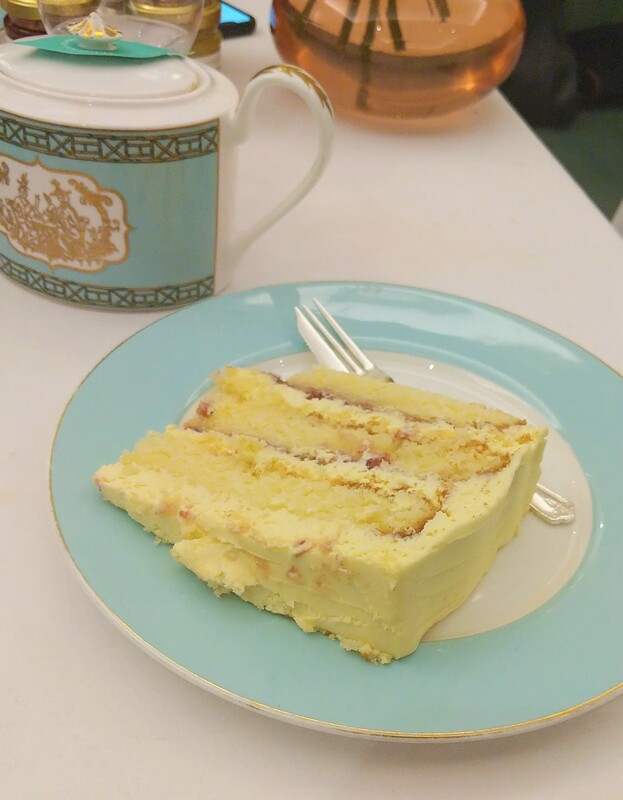 Have you been to Fortnum & Mason? What did you think of the Afternoon Tea? 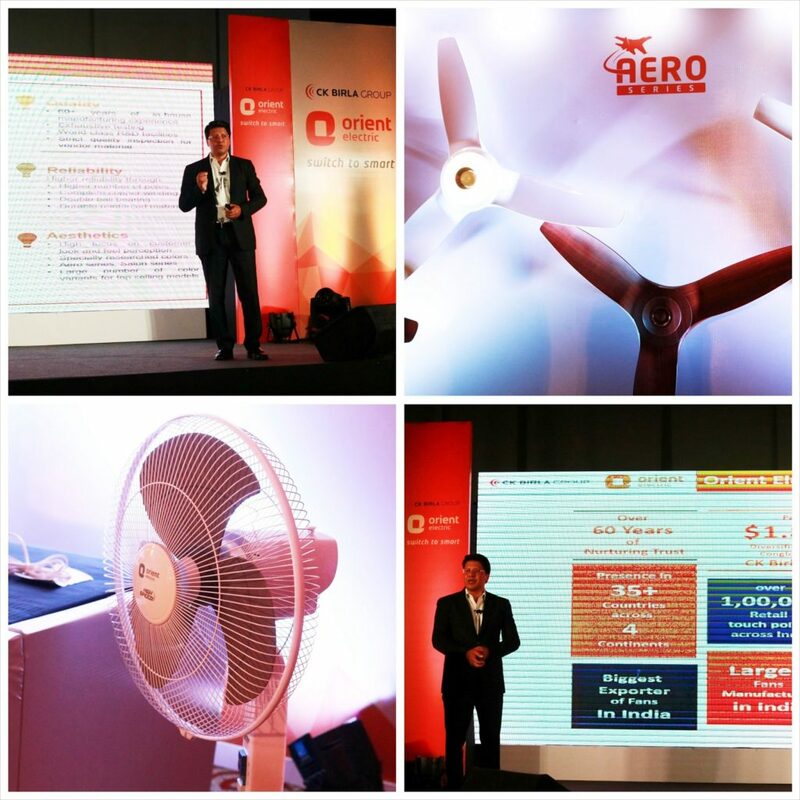 In my previous post, I shared with you my experience of attending an event where I got to know more about the Orient Electric Aero Series range of fans. 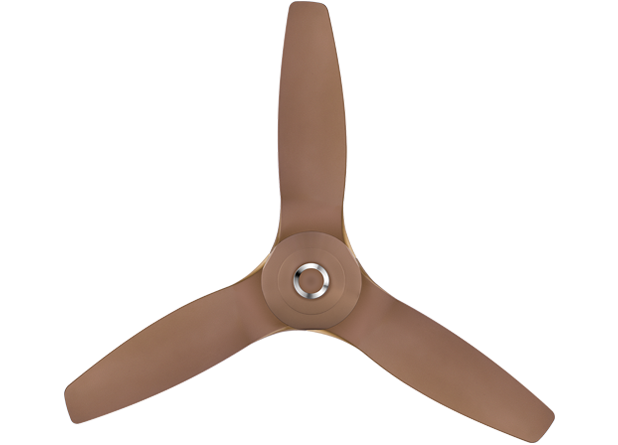 Today’s post is where I write in details about these fans and how they are such a game-changer in the premium ceiling fan market. Today, Home décor is no longer just restricted to fancy furniture, paintings and accessories. Home décor now encompasses everything. It is all about a wholesome experience and that has extended to even our electric appliances and consumer durables. Earlier, seldom did we pay heed to the aesthetics of our electric appliances but now, with changing consumer preferences and rising disposable incomes, the market has witnessed a significant increase in the demand for interior upgrades and this is also fuelling the demand for designer and premium fans. And that is where the Aero Series range of premium fans fit perfectly. These fans are aerodynamically designed; deliver high air delivery of 300 CMM, run silently and to top it all, they flaunt a beautiful design that is sure to add drama to your space. When you look at a ceiling fan do you even think about what kind of technology can go behind creating it? 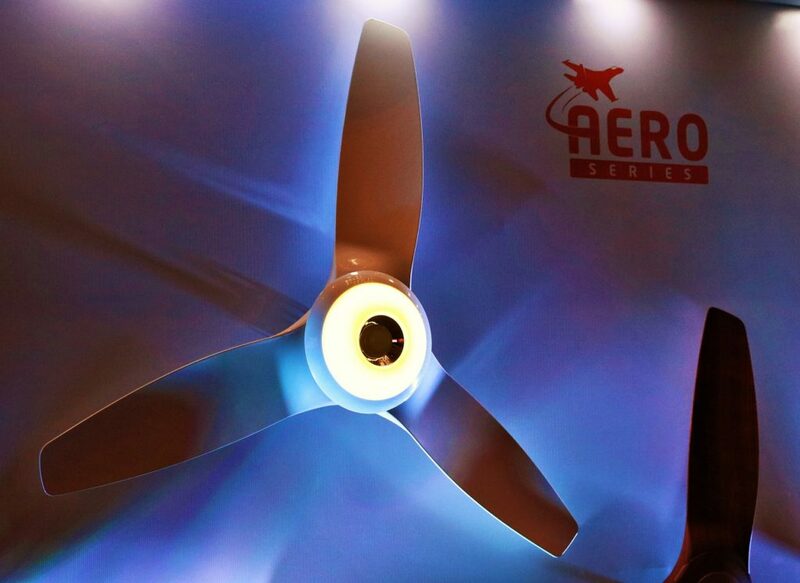 Well, neither did I till I was told at the Orient Electric event that the new Aerostorm & Aerocool fans in the Aero Series range have actually been inspired by the ground breaking winglet technology used in creating modern aircrafts! The unique winglet design in its blades minimizes the vortex, delivering higher air thrust and minimal noise. They have a sweep of 1320 mm and has 100% rust-free blade made of high-grade glass-filled compounded ABS which provides strength to the blades, thus making it bend-proof, rust-proof and easy to clean. Inspired from aerofoil design of Aircraft wings and uses the winglet technology to further reduce the air cutting sound while giving an impressive air delivery of 300 CMM. Sturdiest and heaviest 18-pole motor design for longer life. Metalized UV deco ring, radiant PU paint finish and striking spiral curves which make them very good looking fans! You know that irritating sound of the ceiling fan whirring by? Do you know what causes that? The main reason of fan noise is in fact the sound of air cutting which is produced when blades of a fan cut the air to create turbulence causing air to be pushed. Other factors that contribute to the fan noise including the size and quality of motor, design of blades, mounting hardware and the body material. Well, we can bid adieu to that sound because with the Aero Series range, Orient Electric has for the first time introduced a breakthrough in fans by addressing the important though latent need for silence. Orient Aeroquiet, the first fan launched under this series in 2017, makes 4dbs lesser noise than other fans which means that Aeroquiet reduces noise by 4000 times in comparison to normal fans. Advanced aerodynamic profiled blade design which ensures maximum air throw while reducing sound by reducing friction and turbulence. Sturdiest 18-pole heavy motor with double ball bearing for smooth and silent operation. Orient Aeroquiet runs at 310 RMP and has an impressive air delivery of 240 CMM which is highest in the segment. The fluidic integrated design of Orient Aeroquiet makes it an innovatively beautiful choice for the fifth wall in your home. Orient’s spectacular Aeroseries range of fans is a great combination of technical and visual sophistication. If you are looking for a change in your living space, then this range of ceiling fans has to be the perfect choice. Experience air like never before! You know that feeling when you learn something new about a product and then you look at it with a completely different perspective? That is what happened to me at an event held last week in Kolkata where Orient Electric showcased their new Aero Series range of fans. The humble fan has been around for generations but honestly speaking, we only tend to appreciate it when there is a power cut and we are roasting in the heat and humidity. Thankfully, Orient Electric does not think like us and has made it a motto to completely overhaul our thought process regarding the unassuming ceiling fan with the Orient Electric Aero Series range. 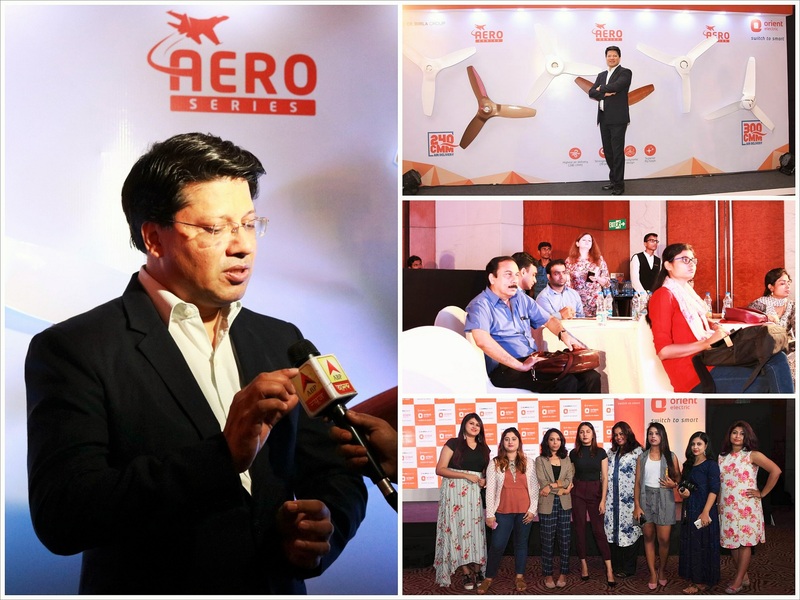 At the event and press conference, we got to see and experience the new range of Aero Series fans which looked like the perfect blend of style, functionality and modern technology. 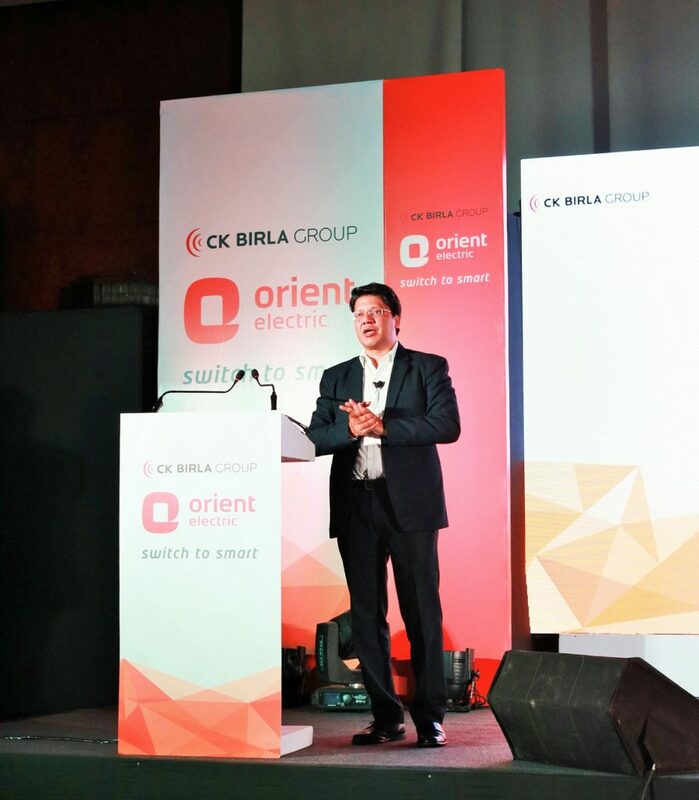 Atul Jain, Sr. Vice president and Business Head, Fans, Orient Electric spoke about the history of the brand and the fact that its journey actually started from Kolkata way back in the 1950’s. 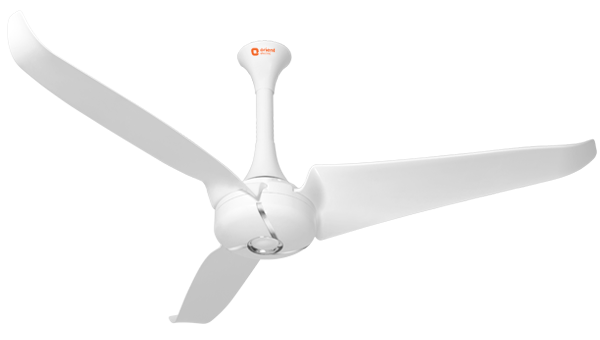 The first fans manufacturing plant of Orient was in Kolkata and the fact that now, every second fan that is exported out of India is an Orient fan. 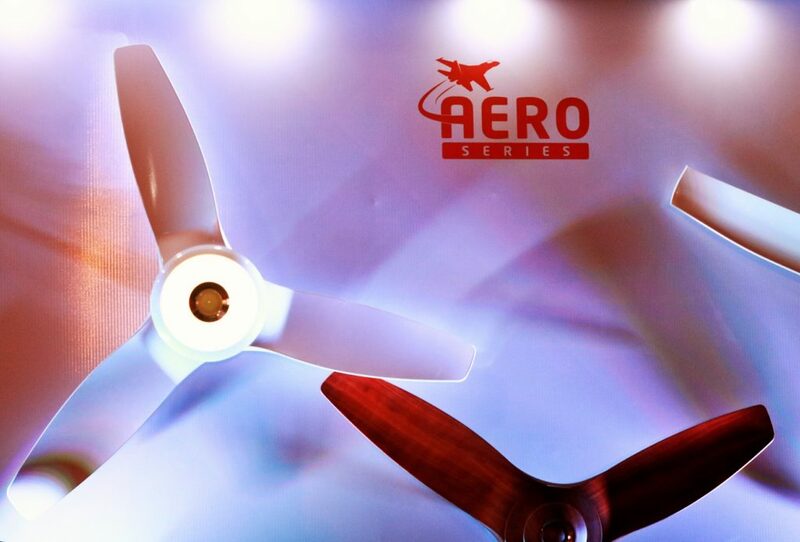 Coming to the Aero series, the idea behind creating these fans was to connect with new-age customers who are looking for a lot more. Gone are the days when people used to buy consumer goods looking only at functionality and value for money. 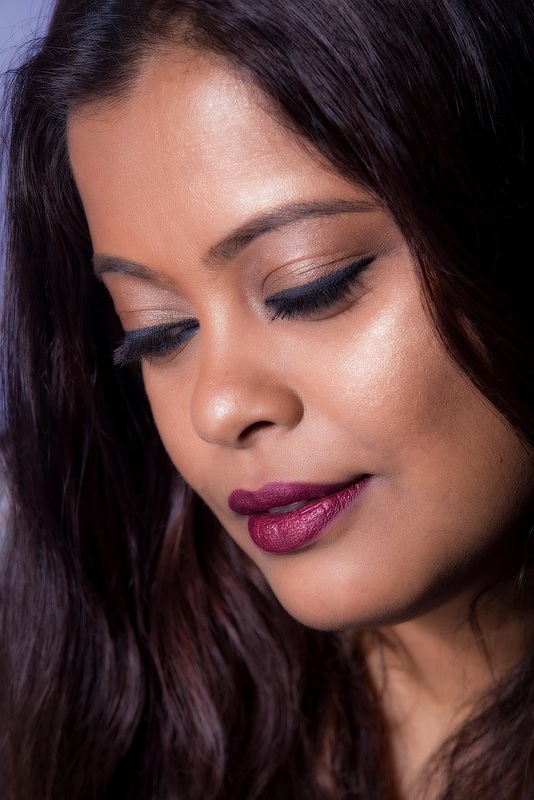 Nowadays, aesthetics play a very important role in determining consumer purchase habits and people are open to shelling out slightly more to ensure that the products align to their personal style and day-today needs. And with the Aero series, Orient Electric aims to do just that. These are a premium range of ceiling fans that focuses on high air delivery, silent operation and elegant aesthetics. 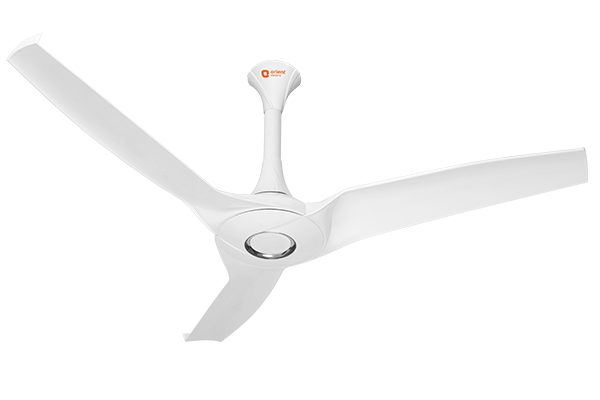 Priced above Rs 4000, the fans are available in different styles and Mr Jain added that the range has been a phenomenal success and it has taken Orient Electric to the No. 1 position in the premium fans segment. He also added that the company is looking to increase market penetration in Eastern and North-Eastern India. This was a very different launch event for me and one that I really enjoyed. Rarely do we get to know about what goes on behind the scenes and the thought-process behind creating a revolutionary product. 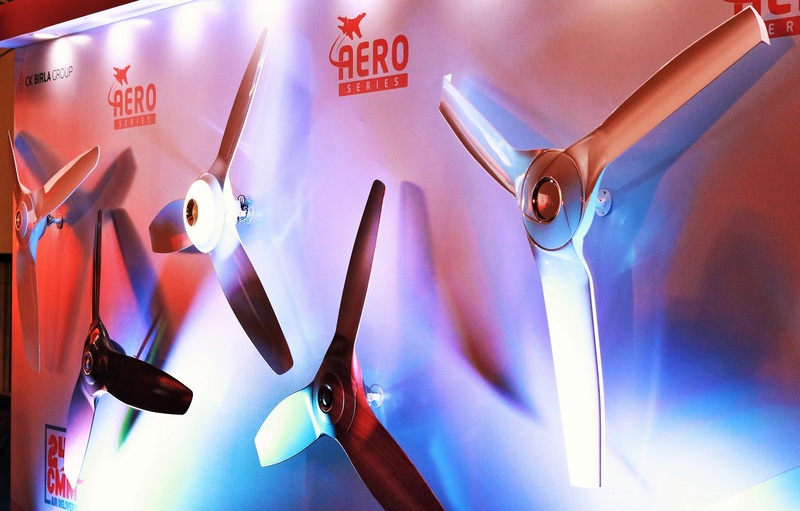 I also got to experience how the Aero range of fans work and I was really impressed by the technology. For details on the Orient Electric Aero Series range and review, watch out for my next post. Since late last year, Hyderabad has pretty much become my second home thanks to work. However, like all business trips, my stay would start on a Monday and get over on a Friday evening so I could never really see much of the city. It was just hotel to office and back to the hotel at night and the same old routine for five days. This month, I spent nearly 2.5 weeks in the city and got a chance to explore. And also, thanks to The Park Hotel, Hyderabad, I spent a weekend in their beautiful property and felt like royalty. One of the best features of The Park Hotel, Hyderabad is undoubtedly the location. It overlooks the Hussain Sagar Lake so the view from the rooms is incredible. Hussain Sagar is one of the most popular sights in Hyderabad and I was told not to miss out on watching the sunrise and sunset by the lake. I did not have to venture outside at all for the view because all I had to do for those two days was to just walk up to the window and see the beauty unfolding right in front of my eyes. Traveller’s Tip – If you are staying at The Park, definitely opt for the Lake View rooms. Another reason why The Park Hotel, Hyderabad can be a perfect choice for a tourist visiting the city is again the location. Major tourist spots like Charminar, Salar Jung Museum, Chowmahallah Palace, the old city is all within a distance of 30-45 mins. Considering Hyderabad’s traffic scene, it definitely makes sense to stay somewhere near these places if you are a tourist. Read on to know more about the property, the rooms and the dining options. How To Figure Out Her Ring Size Without Asking? If you are ready to pop the question, you need a few things to make sure that everything goes smoothly. You will need to create the perfect atmosphere, a suitable location, and of course, an engagement ring. 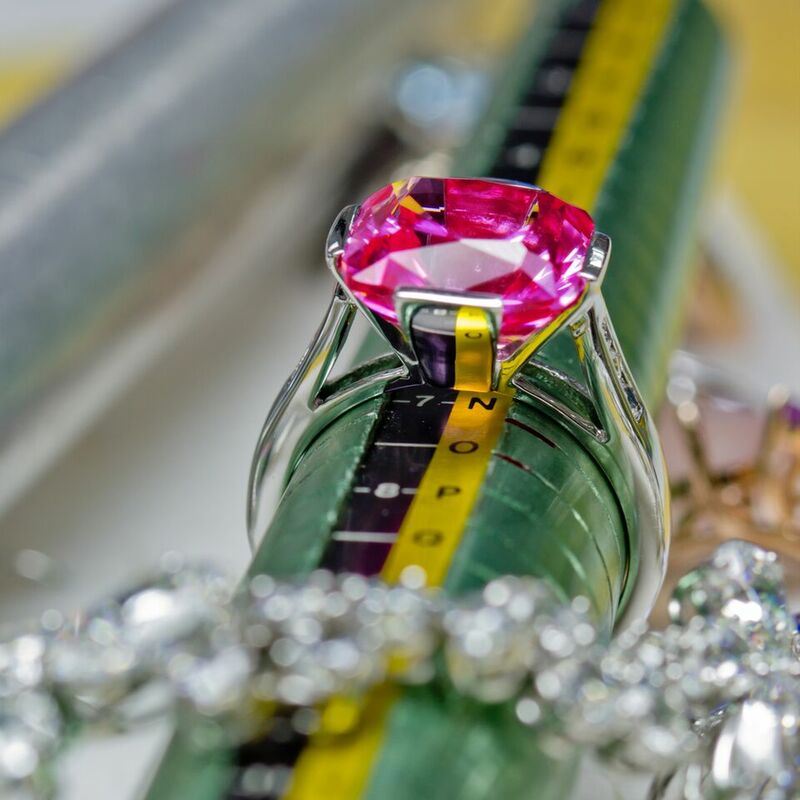 When picking out a diamond engagement ring, you may be so focused on the four Cs of diamonds and finding the ring that suits your chosen one perfectly that you may end up forgetting the most practical aspect of picking out a ring – the size. Even though the band can be resized and changed, wouldn’t it be ideal if you got it perfectly the first time? Here’s How To Figure Out Her Ring Size Without Asking.